Neural crest cells are highly multipotent and strongly migratory cells and generate adult neural crest stem cells with varied roles in cellular homeostasis and regeneration. The optical transparency and ready accessibility of fish embryos make them particularly well-suited to high-resolution analysis of neural crest development. However, the dispersive nature of these cells adds to the challenge of their study, requiring that they be identified using marker expression. 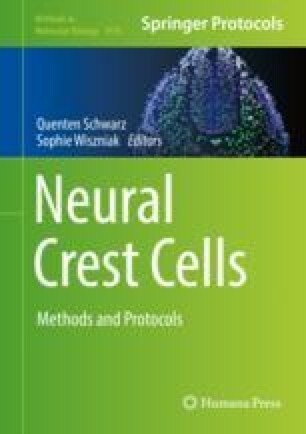 We describe key protocols for the analysis of neural crest marker expression in zebrafish and medaka, including whole-mount in situ hybridization to detect mRNA using conventional chromogenic substrates and the more recent RNAscope which gives readily multiplexed fluorescent detection and immunofluorescent detection of antigens. This work was supported by Sultan Qaboos University Scholarship (R.A.J. ), BBSRC SWBio DTP (K.P. ), the Japanese Society for the Promotion of Research Program for Advancing Strategic International Networks to Accelerate the Circulation of Talented Researchers S2602 (Y.N.) and CONACyT grant 329640/384511 (K.C.-S.), and BBSRC grant BB/L00769X/1 and MRC grant MR/J001457/1 (R.N.K.). We gratefully acknowledge expert guidance on RNAscope from Prof. E. Raz and Dr. A. Paksa (University of Muenster).